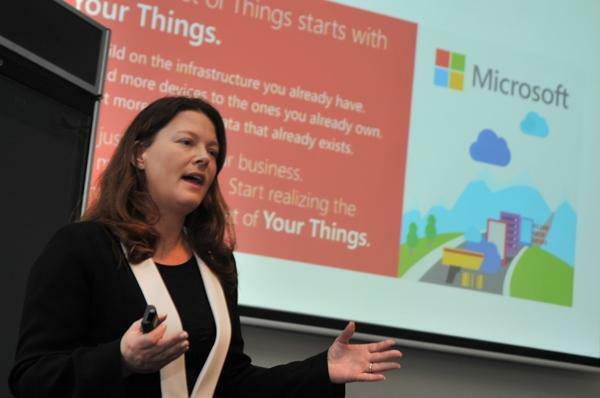 Microsoft Windows Embedded general manager, Barb Edson at the Inter-of-Your-Things event in Sydney. The Internet-of-Things is not the Internet-of-Everything, it's the Internet-of-Your-Things. That's according to Microsoft, who have unveiled their strategy and a number of case studies at their Sydney on the burgeoning tech trend. The case studies included a Coke machine that transforms into a Jukebox, improvements to the London underground, a voting identification system from Genie id and a nail art printing vending machine from Arbor Australia. But the main focus of the strategy, which the case studies all had in common, is the application of the Microsoft's Azure Intelligent Systems Service. Windows embedded general manager, Barb Edson, said while other people were making a lot of noise about IoT, Microsoft was quietly working to look at how people could connect the devices they already have. "I recently announced the limited public preview of the Microsoft Azure Intelligent Systems Service, which reflects a significant step as we continue our commitment to help businesses realise the potential of IoT by harnessing their “things,” she said. "After all, it’s not the Internet of Everything – it’s really the Internet of Your Things, and even the smallest change has the potential to deliver maximum impact. The Intelligent Systems Service marks a critical expansion of the comprehensive Microsoft cloud-first data platform aimed at addressing these challenges facing enterprises. "Built on Azure, the service makes it easier for enterprises to securely connect, manage and capture machine-generated data from line-of-business assets, such as industry devices, sensors and other systems regardless of OS platform," she said. Edson said it was easy to see why IoT was hot, as the scale of having 212 billion “connected things” by 2020, according to IDC, is certainly difficult to comprehend. The same report predicts that IoT will be worth $7.3 trillion by 2017. "The Internet of Things is clearly not a futuristic technology trend," Edson said. "It’s here already in today’s powerful devices, sensors, cloud infrastructures and business intelligence tools. Read more: Amazon posted 16,100 IT job ads last year, tops in U.S. But the the true value lies in data. Edson said by embracing the Internet-of-Your-Things and connecting the most important elements of the network, businesses could unlock the huge potential of the IoT, regardless of whether it’s two devices or 75 billion. Microsoft chief executive Satya Nadella announced the limited public preview of its Azure ISS, on April 15. The company did not announce pricing and exact dates for general availability. According to Gartner analyst, Alfonso Velosa, because Azure ISS is in its early stages of development, there is no real solution for enterprises to buy. "This announcement focused more on Microsoft system integrators (SI) and independent software vendor (ISV) partners that will help develop an IoT ecosystem," he said. "By leveraging its Azure cloud platform, Microsoft is the first Tier 1 software vendor to offer a preview of an integrated solution for the IoT that extends from managing heterogeneous edge devices to the visualization of the data — using a gateway-based security architecture. Velosa said Microsoft already had IoT experience through its embedded business, “channel-class” partners and ISVs. "But this ecosystem will need to expand to OEMs, semiconductor companies, developers, makers and other IoT players," he said. "Microsoft begins the Azure ISS preview with three main SI partners — CGI, Cognizant and Infosys — but is rapidly growing from its current base of 77 partners. He said the current Microsoft Windows Embedded Business management team had established IoT leadership inside Microsoft and appeared to have Nadella as a champion. "By placing ISS under the Azure umbrella, Microsoft has started to align incentives for its global sales force to sell ISS."